Use these quick and easy bed bug bites treatment tips to get relief and avoid complications. Bed bug bites can be awfully irritating and scratching can lead to infection. In most cases bed bug bites can be easily treated with OTC (non-prescription) products... and a few tricks that might surprise you! 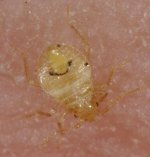 Bed Bug Bites Treatment Tip #1: Don't Scratch!! Treat bed bug bites with care don't scratch them. I know this is easier said than done but it is absolutely key. Do whatever you have to do to resist the urge. Cover your bites with bandaids or wear socks on your hands at night if necessary! Use the remedies on this page to stop the itch. Scratching actually makes the itch worse (we all know that but it’s so easy to forget when you're crawling out of your skin with itchy bites!) Scratching bed bug bites can cause them to become inflamed and even get infected. Wash the area thoroughly and often. Use a gentle, non-drying soap (keep in mind that some soaps can cause skin irritations and allergic reactions themselves). Also, keep your hands as clean as possible. This will help you keep your bited from getting infected if you jusy can't resist the urge to scratch. Plus, many people find that taking either a cold or a very hot shower helps relieve the itch. Strangely enough, my husband found that an ice cold shower gave him the most relief, while a steamy hot bath was really soothing to me. Just try what makes most sense to you. If one doesn't work, try the opposite! I highly recommend Tecnu as a great product to wash with – especially when you first get bites. When my husband’s bites were really bad and causing him lots of anxiety, he literally bathed himself head-to-toe in this stuff. I don’t know if it really does anything to remove the allergen since the bedbug's saliva has actually been injected into your skin. But it made him feel better, even if it was only mentally. Tecnu was first developed to remove micro-particles from radioactive fallout dust so I don't know of anything that could get you cleaner! I believe you should be able to find it at your local pharmacy where the poison ivy products are shelved. Note: If you are going to use this product, read the directions. It's not like a regular soap. You have to rub it on your DRY skin for about 2 minutes, then rinse it off. The drier your skin, the more itchy it will be. So keep it well moisturized! Drink lots of water. Besides a multitude of other health benefits, drinking lots of water helps keep your skin from drying out – so make sure you guzzle down as much water as you reasonably can. After you take a cold or hot shower/bath, lather on your favorite skin cream or lotion. Keep in mind that one that doesn't contain perfumes is probably best – especially if you have sensitive skin. I personally found Noxema skin cream to be helpful. I fell in love with this stuff years ago when I had excruciating sunburn. Not sure that’s been recommended anywhere else, but it had a calming and cooling affect on the bed bug bites I was reacting to later on and it helped keep my skin moisturized. Treat your bed bug bites with your favorite anti-itch cream to get relieve itchiness and reduce other bed bug rash symptoms like redness and swelling. Some folks like to use an antihistamine based cream while others like a hydro-cortisone base cream. I recommend one that contains an antihistamine, hydro-cortisone, AND an analgesic(pain killer) if you are really suffering. Why not get the benefits of all three, right? Use over-the-counter (OTC) allergy medicines as needed. This attacks the allergic reaction that causes the itch from the inside while the cream fight the itch from the outside. Different medicines work better on different people. Use the one that works best for you. My husband really suffered with itchy red welts and it seemed to bother him more at night - probably because he was thinking about it. We finally found that taking an antihistamine like Benadryl right before bed helped with the itch and helped him fall asleep better. That became his go-to bed bug bite treatment when all else failed. Due to the fact that it makes you drowsy, I only recommend taking it at night or right before whenever you go to bed. Many people report that taking an OTC pain killer like aspirin or Tylenol can help - especially when the bites are painful. NSAIDs like Asprin, Advil and Aleve are both pain killers and anti-inflammatory drugs, so they can help with the swelling and inflammation associated with bed bug bites as well. Warning: Aspirin should not be given to anyone under the age of 20. Always remember to read the labels! And did I mention – don’t scratch!! Bedbug bites themselves are not dangerous, even if they can be extremely irritating. The health risk is associated with infections that can develop as a result of scratching or not keeping the skin clean enough. Use an antiseptic soap or follow up with antiseptic spray or alcohol. Bottom line, while it can be extremely annoying to have bed bug bites treatment can be simple and effective if you stick to using these tips. This video is not specifically about treating bed bug bites, but it gives a good overview of how to deal with insect bites in general and highlights some of the differences in how the bites of various look. She shares some interesting home remedies as well. Definitely worth the 6 minutes it takes to watch it!